"One community, around the lake"
5 Annexation and the unincorporated "Urban Growth Area"
Lake Stevens was named for territorial governor Isaac Stevens in 1855 and first settled by Americans in 1886, on a 160-acre (0.65 km2) homestead along the east shore. By 1890 the first town in the area, "Ferry", had been established. Its name was later changed to "Hartford", and it served as the main link from the famed Monte Cristo timber and mining resources to the world. From the 1920s to the 1950s Lake Stevens was primarily a resort community, with many public and private resort beaches scattered around the shore. On November 29, 1960, Lake Stevens incorporated as a City with a population of 900. Soon, its popularity and natural beauty, combined with changing commuter habits, attracted more and more residents, changing its character to that of a suburban community. By 2000 the City had grown to a population of 6,361 in approximately 1.8 square miles (4.7 km2). The lake remains the focal point of the greater Lake Stevens community for recreation and as "a symbol of our need to provide for a sustainable existence that will protect our natural environment". Lake Stevens is located at 48°1′11″N 122°3′58″W﻿ / ﻿48.01972°N 122.06611°W﻿ / 48.01972; -122.06611 (48.019782, -122.066089). According to the United States Census Bureau, the city has a total area of 8.90 square miles (23.05 km2), of which, 8.88 square miles (23.00 km2) is land and 0.02 square miles (0.05 km2) is water. The lake itself is the largest and deepest lake in Snohomish County, with an area of 1,040 acres (4.2 km2) and an average depth of 64 feet (20 m). It is fed by Lundeen, Mitchell, Kokanee, and Stitch Creeks and drained by Catherine Creek, which ultimately flows to the Pilchuck River. The small size of the surrounding watershed compared to the lake minimizes the effects of upstream pollution. This combined with an artificial aeration system allows for a generally good water quality. Much of the shoreline is heavily developed, so few wetlands exist adjacent to the lake. Recreational activities include boating, fishing, and swimming. As of the census of 2010, there were 28,069 people, 9,810 households, and 7,250 families residing in the city. The population density was 3,160.9 inhabitants per square mile (1,220.4/km2). There were 10,414 housing units at an average density of 1,172.7 per square mile (452.8/km2). The racial makeup of the city was 85.1% White, 1.7% African American, 0.9% Native American, 3.6% Asian, 0.4% Pacific Islander, 3.2% from other races, and 5.1% from two or more races. Hispanic or Latino of any race were 8.6% of the population. There were 9,810 households of which 45.1% had children under the age of 18 living with them, 56.3% were married couples living together, 11.9% had a female householder with no husband present, 5.8% had a male householder with no wife present, and 26.1% were non-families. 19.1% of all households were made up of individuals and 5.2% had someone living alone who was 65 years of age or older. The average household size was 2.86 and the average family size was 3.26. The median age in the city was 32.5 years. 29.9% of residents were under the age of 18; 8.5% were between the ages of 18 and 24; 32.2% were from 25 to 44; 23% were from 45 to 64; and 6.5% were 65 years of age or older. The gender makeup of the city was 49.9% male and 50.1% female. As of the census of 2000, there were 6,361 people, 2,139 households, and 1,683 families residing in the city. The population density was 2,951.8 people per square mile (1,142.3/km²). There were 2,234 housing units at an average density of 1,036.7 per square mile (401.2/km²). The racial makeup of the city was 92.31% White, 0.60% African American, 0.91% Native American, 1.10% Asian, 0.31% Pacific Islander, 0.90% from other races, and 3.87% from two or more races. Hispanic or Latino of any race were 3.55% of the population. In the city, the age distribution of the population shows 33.9% under the age of 18, 6.5% from 18 to 24, 36.3% from 25 to 44, 17.6% from 45 to 64, and 5.7% who were 65 years of age or older. The median age was 32 years. For every 100 females, there were 101.6 males. For every 100 females age 18 and over, there were 97.0 males. The city government operates under the mayor-council system. The mayor serves as the executive of the city, while the council serves as the legislative body of the city. In instances of vacation of a seat, the city council has the authority to fill the seat, including that of the mayor. This most recently occurred in November 2016, when position two became vacant after Councilman Sam Low was elected to the Snohomish County Council Position-Five. The City Council unanimously appointed Gary Petershagen to the position. Prominent (non-elected) positions for the city include: city administrator, city clerk, police chief, planning director, public works director, and community programs planner. The city has several boards and commissions whose role is to advise the council on a variety of issues specific to that board or commission. Members of each board or commission are volunteers from the community, either as residents or property owners from within the urban growth area. They are appointed by the mayor with council approval. The exception is with the civil service commission, which all members, who must reside inside the city limits, are appointed by the mayor exclusively. Annexation and the unincorporated "Urban Growth Area"
Additionally, two small annexations have taken place during this time. The Fire District Annexation, the 1.02-acre (4,100 m2) Station 82 property on the southwest corner of Chapel Hill Road and 99th Ave NE, occurred in October 2007 (Ordinance 745), and the Corniche Annexation, the 2.91-acre (11,800 m2) commercially zoned vacant parcel on the southwest corner of Market Place and 91st Ave NE, occurred in March 2008 (Ordinance 768). Neither increased the city's population. Lake Stevens consists of one high school (Lake Stevens High School) and one mid-high school (Cavelero, grades 8-9), two middle schools (Lake Stevens and North Lake) and seven elementary schools (Mt. Pilchuck, Sunnycrest, Hillcrest, Glenwood, Skyline, Highland and Stevens Creek). Stevens Creek opened in 2018 with an adjacent early learning center. ^ Blake, Warner (December 8, 2017). "Lake Stevens — Thumbnail History". HistoryLink. Retrieved February 14, 2019. ^ a b "Integrated Aquatic Plant Control Plan" (PDF). City of Lake Stevens. January 2011. Retrieved 13 June 2011. ^ "Lake Stevens School District / Overview". www.lkstevens.wednet.edu. Retrieved 2017-05-17. ^ Fiege, Gale (August 15, 2014). "Lake is just the jumping off point for fun in Lake Stevens". The Everett Herald. Retrieved March 25, 2019. ^ Jude, Adam (February 6, 2018). "Jacob Eason, former Lake Stevens 5-star QB, officially transferring to Washington". The Seattle Times. Retrieved February 13, 2019. ^ Clarridge, Christine; Lacitis, Erik (September 1, 2017). "Local pro skateboarder Cory Kennedy arrested after Vashon Island crash kills beloved videographer". The Seattle Times. Retrieved February 13, 2019. ^ Bray, Kari (September 25, 2014). "Chris Pratt's star rises, but Lake Stevens roots keep him grounded". The Everett Herald. Retrieved February 13, 2019. ^ Myhre, Rich (July 1, 2011). "Trixie Dynamite". The Everett Herald. Retrieved February 13, 2019. 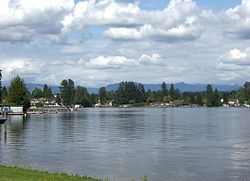 Wikimedia Commons has media related to Lake Stevens, Washington.